Well if we talk about social networking site, Facebook will be the first one to strike our mind and we all know that Mark Zuckerberg is the owner and lord of the social network giant Facebook. 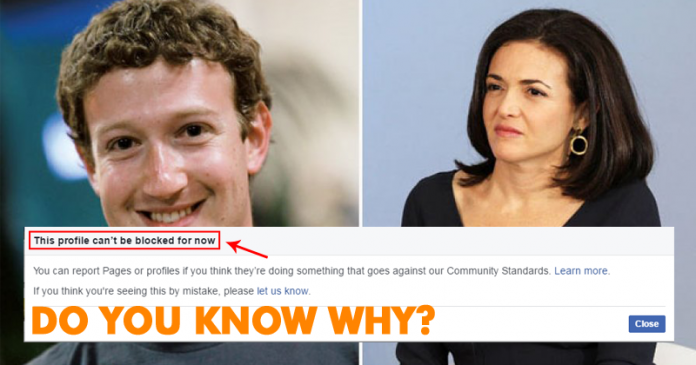 However, did you know that you can’t block Mark Zuckerberg, Priscilla Chan and Sheryl Sandberg on Facebook? Mark Zuckerberg is the owner and lord of the social network giant Facebook. As he is the founder and CEO, so he can do whatever he wants in his social network. Is this statement really true? It seems that yes because it has even been granted the freedom to become one of the few users of the social network giant Facebook that can not be blocked, the privilege that it shares with his wife and with the Chief of Operations of the company. What if you try to block Mark Zuckerberg, Priscilla Chan or Sheryl Sandberg on the social network giant Facebook? An error message appears that communicates to you that such action can not be executed. It does not have any apparent explanation because they are the only profiles that enjoy this exceptional feature. When the social network giant Facebook spokesman has been questioned on the matter, the answer has not raised any doubt. He has simply stated that “some people trying to block profiles can see an error message if these profiles have been blocked many times in a short period of time.” The explanation is not supported, as it has been proven that other unpopular profiles can be perfectly blocked. We have been able to verify that, indeed, you can not stop receiving updates from these pages or profiles. The easiest and obvious is that you stop following them, but why do not we have the freedom to block at any discretion anyone you want? The decision is one more in a long history of unilateral decisions by the social network giant Facebook Inc, the company that groups all the subsidiaries bought successively by the company founded by Zuckerberg. We speak for example of WhatsApp or Instagram, two investments that until now have been quite profitable for Facebook.